1988 was a magical season for Samuel Jacobs. A senior at Cornell University, he led the Big Red to the first Ivy League Championship in the school’s history, earning All-Ivy First Team honors in the process. He was named the Ivy League Player of the Week three times that season and was voted the Team MVP. A native of Cherry Hill, NJ, Jacobs grew up watching his father coach high school basketball in South Jersey. Apparently he received good coaching himself because by the time he graduated from Cherry Hill West, he had scored 1123 points and was voted Team MVP his junior and senior seasons. Jacobs was also selected to the All South Jersey team and was named All Conference twice. In addition, he was selected as a first team Jewish All American. The caliber of Jacob’s play was best reflected by Cherry Hill West’s remarkable success his final scholastic season. The Lions went 25-4 and earned a rare appearance in the South Jersey title game. Recently, he was inducted into both the Cherry Hill West and South Jersey Basketball Halls of Fame. If Jacobs took his high school team to another level, he went even further his final year at Cornell. The Big Red had an 11-3 conference record, won the Ivy title and gained a bid to the NCAA Tournament for the first time since 1954. The team traveled to Los Angeles to play in college basketball’s shrine, Pauley Pavilion, versus a Final Four-bound Arizona team that featured four future NBA stars led by Steve Kerr and Sean Elliott. Cornell lost by 40 points. His all-time favorite place to play was, and always will be, the Palestra. 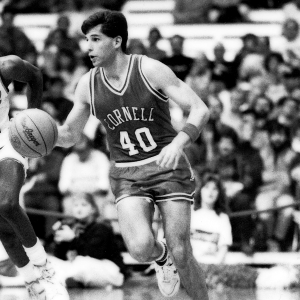 While at Cornell, Jacobs was named Defensive Player of the Year in 1987 and the following season was named a member of the Music City Invitational All-Tournament Team as well as Honorable Mention All American. He was further honored as the 1988 Jewish College Basketball player of the year.